Many thanks to the publisher and Netgalley for providing me with a copy of this book in exchange for an honest review. 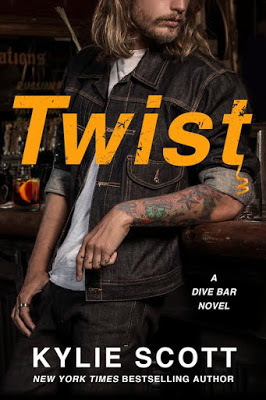 Twist is the second instalment in the Dive Bar series from Kylie Scott and it was much better than the first one Dirty. Twist follows Joe Collins and Alex Parks (a new character that we’re introduced to in this book) as they right their wrongs – or rather, Joe rights his wrong and Alex does her utmost to make things hard for him. The story begins with Alex Parks appearing at the Dive Bar on a random to meet Eric Collins, Joe’s brother. It appears that judging from the beginning of the book that Eric and Alex have been conversing via online dating for a while before she takes a leap of faith and goes to meet Eric for his birthday. But this was expected, as to be fair, there wouldn’t be a book if there wasn’t at least one disaster to be fixed! What follows is one of the best written contemporary novels I’ve read in a long time; there was plenty of humour and drama, characters to fall in love with and a storyline of catfish proportions. There was a perfect balance between the two main characters and the secondary characters with little friction but with a quick & wicked sense of camaraderie between all the Dive Bar and Alex. You know how a book is generally considered good when part of the plot gives you a sucker punch to the gut like no other? Twist had this and it had it in spades. I was already feeling poorly and receiving this ARC made my week; that one section though. Kylie – no word of a lie, brought a little tear to my eye. Such a hard hitting side arc. At first I was a little off put by Alex as she seemed really uncomfortable in the situation but as the story progressed Kylie explained the whys and wherefores and it made her reactions to certain things make all the more sense. Joe was just as mysteriously bearded as he was in Dirty and it was lovely to see the other side to Joe that we see in this book. It was a little shorter than I expected – length wise – but it was incredibly fast paced and before I knew it I’d blasted through 20% in under 15 minutes which is another sure fire sign of a great book. Kylie’s writing has done nothing but improve over the course of her books and another great part about Twist? The Stage Dive boys & girls were back in town! The ending was perfect and I mean that in all the ways. I need the next book Chaser ASAP. It’s hard reviewing this book without giving away any crucial details.